Located in the centre of Al Ain, the fort takes its name from the large, rectangular, three-storey tower that dominates its lowwalled courtyard. (Former President) the late Sheikh Zayed Bin Sultan Al Nahyan (may his soul rest in peace) ordered the construction of the fort in 1948 when he ruled the Eastern Region, and its original use was as a watchtower and headquarters for the royal guards. The fort once formed the focal point of the community, providing a venue for wedding ceremonies, religious festivals such as Ramadan, and formal appointments. At times it was used as a prison and a police station. At the street entrance, the multi-foil arch has a traditionally constructed ceiling of date palm trunks and woven palm-frond matting. 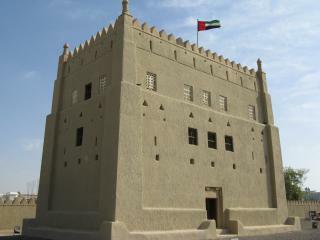 The newly-constructed arish or palm branch hut which can be seen to one side of the main tower is an excellent example of traditional Emirati vernacular architecture.